In TS, electrocardiograms (ECGs) show tall right atrium (RA) P waves and no RV hypertrophy. Chest radiographs show a dilated RA without an enlarged pulmonary-artery segment. ECG findings are frequently nonspecific. Incomplete right bundle-branch block, Q waves in lead V1, and atrial fibrillation are often noted. Doppler echocardiograms depicting TR are provided below. Tricuspid regurgitation (TR). 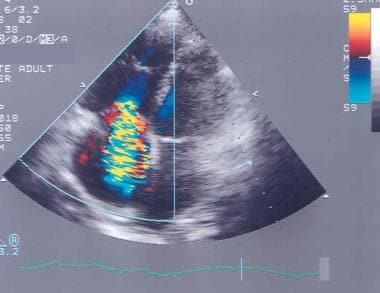 Apical 4-chamber color Doppler echocardiogram shows a large mosaic blue jet fanning downward from the coaptation point of the tricuspid valve into the right atrium. The area of the color jet and the extent of penetration into the RA may be used to determine the severity of TR. On this image, the TR appears to be severe. Doppler echocardiographic assessment of a tricuspid regurgitation (TR) jet may be useful in predicting the severity of pulmonary hypertension. The distance from the baseline to the peak of the TR is measured (in centimeters) and expressed as velocity (V). This value is then used to determine the gradient across the tricuspid valve (in millimeters of mercury) as 4 X V2. 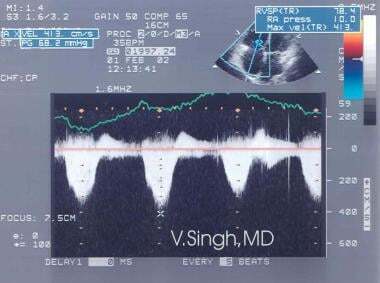 On this image, V is 3.25 cm; therefore, the calculated gradient is approximately 42 mm Hg. By adding the right atrial pressure (usually taken as 10 mm Hg) to this value, the systolic right ventricular and pulmonary arterial pressure may be determined. In this patient, the systolic pulmonary arterial pressure is 52 mm Hg, which represents moderate pulmonary hypertension. In TS, radiographs may show marked cardiomegaly with conspicuous enlargement of the right atrium (RA) (ie, prominence of the right heart border), which extends into a dilated superior vena cava and azygos vein; conspicuous dilatation of the pulmonary artery may be absent. Vascular changes in the lungs characteristic of mitral valvular disease may be masked, with little or no interstitial edema or vascular redistribution; however, left atrial enlargement may be present. In patients with functional tricuspid regurgitation, marked cardiomegaly is usually evident, and the RA is prominent. Evidence of elevated RA pressure may include distention of the azygos vein and the presence of a pleural effusion. Ascites with upward displacement of the diaphragm may be present. Systolic pulsations of the RA may be present on fluoroscopy. In tricuspid valve disease, findings are generally nonspecfic, and false findings are frequent. The major hemodynamic effect of TR is augmentation of the total stroke volume of the RV. SE MRIs can display the RV myocardium well. SE MRI may be the preferred technique for accurate assessment of RV function, such as measurement of RV end-diastolic, end-systolic, and stroke volumes, as well as the ejection fraction. When the RV wall is thickened and hypokinetic, particularly with ventricular arrhythmias or syncope, MRI may be used to look for RV dysplasia (transdifferentiation of myocardium to fat). In addition to the RV, SE MRI may show enlargement of the RA, vena cava, and hepatic veins. SE images may show structural abnormalities other than TR, including Ebstein anomaly, pacemaker leads, valvular vegetations, tricuspid prolapse, and carcinoid syndrome. Cine GRE images are used to determine the severity of TR by demonstrating the area of the signal void of the regurgitant jet traveling into the RA in systole. It is best imaged in the 4-chamber view and the coronal oblique view displaying the RA and the RV. As with Doppler echocardiography, velocity-encoded (VENC) MRI permits assessment of the severity of regurgitation by determining the maximum velocity (Vmax) in the regurgitant jet with velocity measurements in a plane parallel to the jet (in-plane measurement). The velocity measurement may then be used to calculate pulmonary arterial systolic pressure (PPA) by adding RA pressure (PRA, which is empirically taken to be 10 mm Hg) to the RV and RA pressure gradient (P). For this purpose, the following modified Bernoulli equation is used: PPA = 10 + (4 X Vmax2). Transesophageal echocardiography provides details of valvular structure. [6, 7, 8] Echocardiographic images depicting TR are provided below. Two-dimensional transthoracic echocardiogram apical 4-chamber view shows a large, blue jet extending from the coaptation point of the tricuspid valve leaflets to the distal (superior) end of the right atrium. Measuring the area of the color regurgitant jet is a semiquantitative method of estimating the severity of tricuspid regurgitation. Doppler echocardiogram shows the method for measuring the flow velocity of the tricuspid regurgitation and using it in the Bernoulli equation (gradient = 4 X V2) to calculate the pressure gradient. Adding the right atrial (RA) pressure (usually 10 mm Hg) may provide a good estimate of the systolic pulmonary arterial pressure. Doppler echocardiography shows a prolonged slope of antegrade flow; Doppler echocardiography compares well with cardiac catheterization in the quantification of TS and in the assessment of associated TR. Exaggerated motion and delayed closure of the tricuspid valve are evident in patients with Ebstein anomaly. Prolapse of the tricuspid valve resulting from myxomatous degeneration may be evident on echocardiography. Echocardiographic indications of tricuspid valve abnormalities, especially TR, as evidenced on Doppler examination, may be seen in most patients with carcinoid heart disease. In patients with TR caused by endocarditis, echocardiography may reveal vegetations on the valve, or it may show a flail valve. 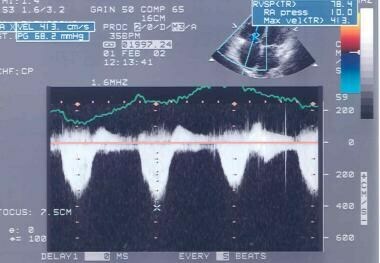 Transesophageal echocardiography is useful in the detection of TR. Contrast echocardiography involves rapid injection of saline indocyanine green dye or sonicated human albumin (Albunex) into an antecubital vein while a 2-dimensional echocardiogram is recorded. The injection produces microcavities that are readily visible on echocardiography and that travel normally as a bolus through the circulation. In TR, these microcavities may be seen to travel back and forth across the tricuspid orifice and to pass into the inferior vena cava and hepatic veins during systole. Pulsed Doppler echocardiography reveals systolic flow from the RV to the RA; it is a sensitive technique for detecting and quantifying TR. Reverse flow may also be recorded in the inferior vena cava and hepatic veins. The peak velocity of TR flow is useful in the noninvasive estimation of RV (and pulmonary arterial) systolic pressure. Color-flow Doppler imaging is a sensitive and specific method for assessing TR; it is helpful in selecting patients for surgical treatment and in evaluating postoperative results. The degree of confidence in echocardiography is high, and false findings are rare. Patients who present with congestive heart failure may require assessment of tricuspid valve and LV function by use of a first-pass technique (ie, multiple-gated acquisition [MUGA] scanning). The degree of confidence is moderate, and findings may be nonspecific. In patients with TR, there is often an elevation of RA and RV end-diastolic pressures, whether the condition is the result of organic disease of the tricuspid valve or is secondary to RV systolic overload. The RA pressure tracing usually reveals an absence of the x descent and a prominent v or c-v wave (ventricularization of the atrial pressure). The absence of these findings essentially excludes moderate or severe TR. As the severity of TR increases, the contour of the RA pressure pulse increasingly comes to resemble that of the RV pressure pulse. An increase in RA pressure on deep inspiration or no change in RA pressure on deep inspiration, rather than the usual decrease, is a characteristic finding. Measurement of the pulmonary arterial (or RV) systolic pressure may be helpful in determining whether the TR is primary (ie, caused by disease of the valve or its supporting structures) or functional (ie, secondary to RV dilatation). A pulmonary arterial or RV systolic pressure less than 40 mm Hg suggests a primary cause, whereas a pressure greater than 55 mm Hg suggests that TR is secondary. Intermediate values are not helpful. In many instances, right ventriculography may be helpful in the diagnosis and quantitative assessment of TR. The degree of confidence in angiography is high, and false findings are rare. Patanè S, Marte F, Di Bella G, Chiribiri A. Ebstein's anomaly in adult. Int J Cardiol. 2008 Jul 16. [Medline]. Rodés-Cabau J, Taramasso M, O'Gara PT. Diagnosis and treatment of tricuspid valve disease: current and future perspectives. Lancet. 2016 Apr 1. [Medline]. Huttin O, Voilliot D, Mandry D, Venner C, Juillière Y, Selton-Suty C. All you need to know about the tricuspid valve: Tricuspid valve imaging and tricuspid regurgitation analysis. Arch Cardiovasc Dis. 2016 Jan. 109 (1):67-80. [Medline]. Lancellotti P, Tribouilloy C, Hagendorff A, Popescu BA, Edvardsen T, Pierard LA, et al. Recommendations for the echocardiographic assessment of native valvular regurgitation: an executive summary from the European Association of Cardiovascular Imaging. Eur Heart J Cardiovasc Imaging. 2013 Jul. 14(7):611-44. [Medline]. Shah S, Jenkins T, Markowitz A, Gilkeson R, Rajiah P. Multimodal imaging of the tricuspid valve: normal appearance and pathological entities. Insights Imaging. 2016 Jun 9. [Medline]. Addetia K, Yamat M, Mediratta A, Medvedofsky D, Patel M, Ferrara P, et al. Comprehensive Two-Dimensional Interrogation of the Tricuspid Valve Using Knowledge Derived from Three-Dimensional Echocardiography. J Am Soc Echocardiogr. 2016 Jan. 29 (1):74-82. [Medline]. Mart CR, Eckhauser AW, Murri M, Su JT. A systematic method for using 3D echocardiography to evaluate tricuspid valve insufficiency in hypoplastic left heart syndrome. Ann Pediatr Cardiol. 2014 Sep. 7 (3):193-200. [Medline]. Cotrim C, Miranda R, Loureiro MJ, Almeida S, Lopes L, Almeida AR, et al. Echocardiography during treadmill exercise testing for evaluation of pulmonary artery systolic pressure: advantages of the method. Rev Port Cardiol. 2008 Apr. 27(4):453-61. [Medline]. Ike SO. Echocardiographic analysis of valvular heart diseases over one decade in Nigeria. Trans R Soc Trop Med Hyg. 2008 Jul 19. [Medline]. Saremi F, Hassani C, Millan-Nunez V, Sánchez-Quintana D. Imaging Evaluation of Tricuspid Valve: Analysis of Morphology and Function With CT and MRI. AJR Am J Roentgenol. 2015 May. 204 (5):W531-42. [Medline]. Lopez-Mattei JC, Shah DJ. The Role Of Cardiac Magnetic Resonance In Valvular Heart Disease. Methodist Debakey Cardiovasc J. 2013 Jul. 9(3):142-148. [Medline]. [Full Text]. Speiser U, Abas A, Henke C, Sandfort V, Jellinghaus S, Sievers B, et al. Time-resolved magnetic resonance imaging of contrast kinetics to identify severe tricuspid valve regurgitation. Acta Cardiol. 2013 Jun. 68(3):247-53. [Medline]. Ha JW, Chung N, Jang Y. Tricuspid stenosis and regurgitation: Doppler and color flow echocardiography and cardiac catheterization findings. Clin Cardiol. 2000 Jan. 23(1):51-2. [Medline]. Blaustein AS, Ramanathan A. Tricuspid valve disease. Clinical evaluation, physiopathology, and management. Cardiol Clin. 1998. 16(3):551-72. Ewy GA. Tricuspid valve disease. In: Chatterjee K, Cheitlin MD, Karliner J, et al, eds. Cardiology: An Illustrated Text Reference. Vol 2. Philadelphia, Pa: JB Lippincott;. 1991:991. Kratz J. Evaluation and management of tricuspid valve disease. Cardiol Clin. 1991. 9(2):397-407. 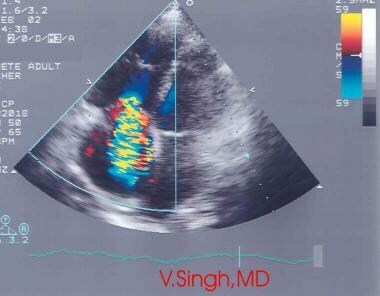 Mittal SR, Khanna S, Mathur D. Rheumatic mitral and tricuspid valve disease. Int J Cardiol. 1997. 59(3):317-9.